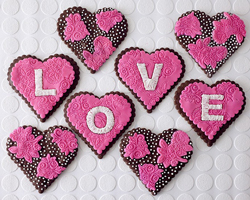 Simple tools create fantastic appliques, swags, and embroidery. 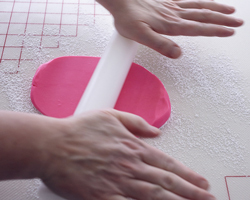 On a lightly dusted surface, roll out your fondant with a plastic rolling rod. 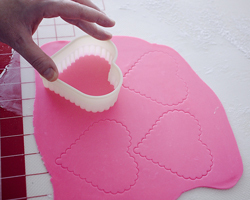 Using a cookie cutter that is slightly smaller than your cookie, gently press the cutter into the fondant. 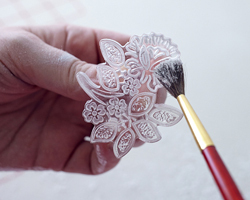 Lightly dust the impression cutter with powdered sugar. 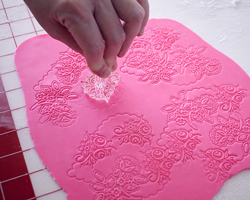 Gently press the stamp onto the fondant. You don't have to stay in the lines! 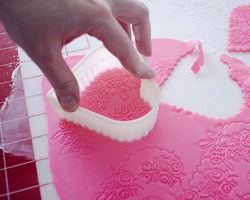 Press the cookie cutter back into the original impression. 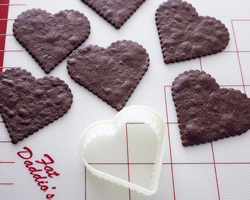 Press firmly and remove heart. 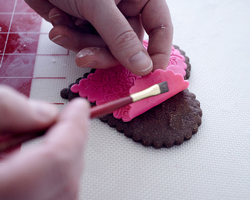 Add a little water to the bakc of the fondant and glue onto the cookie. Professional results and details in less time.